When we think of cooking on the grill we think hamburgers, hot dogs and perhaps a good steak or two. For a lot of people the last thing to come to mind is fruit. But those people are missing out. Apples, pineapple & Pears are so good. Make sure they are nice and firm when choosing them. If you decide to try softer fruits like peaches, papaya, or nectarines you have to pay close attention, as they heat very quickly. If overcooked soft fruits you will be left with nothing but mush. Soft fruits are not so much cooked as they are heated. Some fruits are great cooked in their skins also. You should try bananas, pineapples or tangerines. 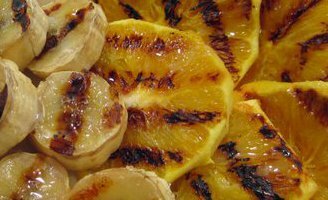 There are many fruits that can be grilled just by cutting them in hald these include bananas, apples, pineapples, plums, peaches, and pears can be cut in half just pit or core them. Citrus and juicey fruits do better cut in thick pieces. or an oil-based marinade. I try to avoid olive oil as it has a heavy taste to me. I love some of them with Coconut oil though. You should try it with the pineapple. Yum. 2 tbs. of lemon juice. I leave fruit in over night. I am sure you can find a million recipes on here if you search. My biggest piece of advice is experiment and have fun.